Three carrying options: back pocket, around the neck, or belt-mounted. 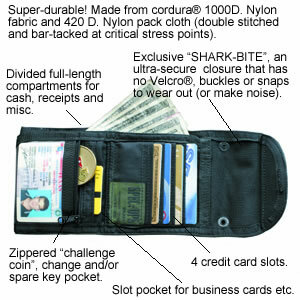 Divided full-length compartments for cash and receipts can be zipped closed to form a hidden pocket. Super-durable! Made from Cordura� 1000D. nylon fabric and nylon pack cloth, double stitched and bar-tacked at critical stress points. Compact, measures 4-by 4 inches closed.